TEMPORARILY DISCONTINUED: Pending expansion of our facilities and manufacturing capabilities, this product is temporarily discontinued until further notice. We cannot provide any further information by email or phone about this matter. Please note: For optimal drinking/cooking water, our countertop and undercounter filters are more effective than whole house units. And for signficantly improved shower water, our PureShower Filter is a great option. Clean water cleaning me and my home! LOVE LOVE LOVE!!! Finally I have wonderful whole house tap water that I can drink!!!! I have been researching water filters for a few years and was really disappointed with the options and costs, water waste, awkward management of units etc. 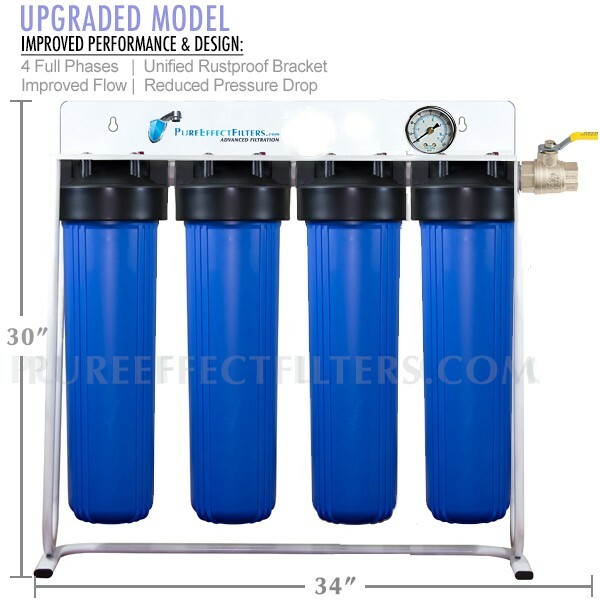 Finally I followed through on a review, recommendation by Dr. Carolyn Dean who confirmed that she loves the filter system. I am REALLY HAPPY with my new house filter. Where I live the water is hard (10 on a scale of 1-10) and smells/tastes chlorinated and other unknown non water elements that are scary to consume. I never drank the tap water let alone give my pets that water without putting it through a brita. That was then. Now, bathing, showering, washing, drinking are all a happy even joyous experience. The water is so soft and leaves my skin and hair really soft too. I have only had the filter for a month or so, the first few days after installation the water tasted odd, sort of papery, but after a few days, maybe a week, it all started to taste like mountain spring water with no smell at all. I love the easy install and the filter placement, all you do is screw the cylinders in and voila. The price point is really reasonable too, especially with only having to replace filters once a year. If things turn less positive I will update this review but for now I feel that finally I am not drinking, bathing or washing in toxic water. What a RELIEF! Thank you for your passionate review Katie, we are very happy to read it! A few points I'd like to clarify for you and our other customers. The "Papery" taste you mention is a normal and expected effect of the natural calcium in the system adapting, so during the initial usage the water may taste/smell "earthy" or "papery", but as you already noted, this quickly subsides. With regard to drinking/cooking with this water: Although your water quality is now significantly improved, it still passes/sits in your plumbing system before it comes out of your faucet, so there is potential for it to absorb contaminants from your plumbing system, as such, we recommend one of our countertop/undercounter filter systems for the kitchen to clean the water directly AFTER the plumbing system and at much slower flow rate, which also helps with even greater efficacy for removing some of the most difficult contaminants to the highest %. e.g. fluoride. I'll provide a quick list of pros and cons, but want to say that overall I'm very pleased with my purchase. 1. The customer service is excellent. Igor was very helpful on all of the many occasions that I called. 3. The set-up isn't too hard, but I did use a plumber. I placed my unit outside, so this set-up was a bit different. I know these units aren't made to go outside in the elements, but my water line starts at the road and then branches out in all directions before reaching the house. If I wanted to filter it all, I had to start there. So, my set-up was a bit more difficult than the average set-up will be. If I had put it in a garage, it would have been even simpler. 4. It holds up very well outside. I have mine covered and insulated. There have been no leaks or breaks as of yet. I'm going on my second year now, so things may change. I have had a problem with rust on some of the parts, but I think this is due to the fact that there is so much condensation on my unit from the insulation and outdoor temp. variation. In a garage, I don't think there would be much rust, if any. 5. It removes the chlorine very well. The smell and texture of my water has changed dramatically. When I had to remove the cartridges for about a week (I was behind in ordering new ones), I was shocked at how strong the chemical smell in the water was. It burned my eyes and skin- my water co. gets in trouble regularly for their violations. When the unit is in, I detect none of this. With the filter, I never get chlorine burns or rashes from the water anymore. 1. Low water pressure. Even when I fully open the faucets, there is a noticeable difference in pressure. Usually, after I first replace the cartridges, the pressure isn't too bad. After a while though the pressure becomes much lower. If someone on the other side of the house flushes while I'm in the shower, my pressure is easily cut in half. This, naturally, worsens as the cartridges become older. Some of this may be due to the distance of the filter from the house, too. 2. Carbon. It is not always easy to flush the carbon out of the cartridges completely. I try to flush into the yard before I let the water go into the house pipes, but even then, some always gets in. The amount varies from cartridge replacement to cartridge replacement. My first time was horrible. My second time, there was no carbon. The last time, there has been a medium amount. I see it mostly in the toilets. There is a black residue that remains. However, to me, this is a minor inconvenience compared to the benefit of having the filter. 3. Price. I wish the replacement cartridges were cheaper, since I have to replace them about 3 times a year. 4. Messy. This is just the nature of filters, but replacing the cartridges can be messy. Water will get on and around you. With a smaller filter this isn't a problem, but with one this size, that's a significant amount of water. I wouldn't recommend putting this inside of a home. A garage is your best bet. Overall, I'm pleased with my purchase. If I had to do it all over again, I'd definitely buy the filter. I do wish the cartridges lasted longer somehow. I guess this isn't possible without a larger unit, which I don't want. As for my star rating. I gave it a 4 on water quality because of the carbon issue and pressure issue. I putting a 4 on build quality because of the plastic connecting parts on the unit (not the housings- those are fine). To better and easily flush new cartridges, we recommend installing a drain/bypass valve at the output of the filter, which allows to simply connect a garden hose and flush out the cartridges without spilling water everywhere. When changing cartridges, there are some basic steps we recommend to help with minimizing water spilling, please contact us to confirm if you're doing this properly. With regard to the plastic connecting parts, we have switched those out to lead-free brass. If you'd like to replace yours with brass ones, please give us a call. We have improved even more since you purchased your system, and it is because of feedback like yours. Thank you very much, and please don't hesitate to contact us if you every have any concerns or need some advice on your system.